Have you ever wished that you could park closer to the school on those cold and blustery days? What about on big game nights, when the parking lot is packed and you are trying to get out, ever wished you were right up front? Well for some people this wish came true. 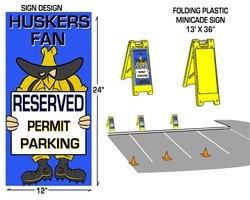 The Booster club has auctioned off "Reserved" parking for football games, boys basketball, girls basketball and wrestling events. We have three spots for each event and three lucky people get to park up close to the school. During the Winter Meet The Huskers we had an auction and the top bidders received a parking pass, limited edition and the rights to park in one of three spots. The spots are marked by a yellow sign with a special reserved parking sign on it.